I love pastry cream. I could eat it by the spoonful, and one of the best things about making it is licking the spoon, beaters, bowl, etc. – if it has pastry cream on it, it is fair game. 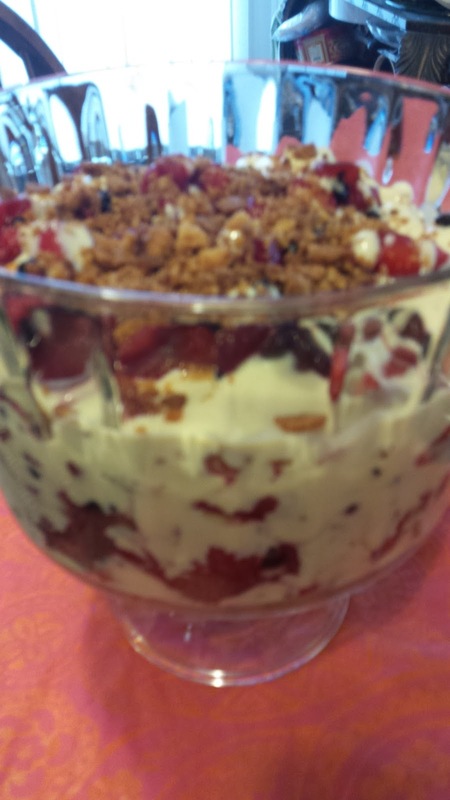 A Mixed-Berry Trifle (pictured below) or Strawberry Cream Pie are two desserts I use vanilla pastry cream in. Summer lends itself to strawberry everything, and they are two of my favorites. Put the half and half, 1/2 C sugar, and salt into a saucepan with a heavy bottom. If you’re using vanilla beans, scrape the insides out and put into the pan now. If you’re using vanilla extract, wait and put it in warm finished pastry cream. Bring the mixture to a simmer over medium low heat, just until tiny bubbles appear around the edges of the pan. The sugar should be dissolved at this point. While the half and half is heating up, whisk the egg yolks with the 3 T sugar until the sugar is dissolved. Add the cornstarch and keep whisking until everything is mixed together. Temper the eggs: When the half and half is at a simmer, stream one ladle-full at a time to the egg mixture, whisking the eggs constantly. Gradually add more half and half until the eggs are fully warmed through, then add the egg mixture to the remaining half and half. Cook on low heat, whisking constantly, until the custard thickens. If you can make a line on the back of a wooden spoon with your finger, the custard is thick enough. If the line closes up, keep cooking. For a smooth pastry cream, sieve the mixture through a fine mesh strainer. Add the butter to the hot cream, and stir to combine. If you’re using vanilla extract, add it once the butter is incorporated. Add the cognac at this point if you’re using it. Stir to combine. Pour the pastry cream into a container, and top with plastic wrap directly on the surface of the cream to prevent a skin from forming. Keep it refrigerated and tightly covered. This can be made several days in advance, and it’s best to make it the day before so it is completely cooled.